#1 - An employee is not meeting your expectations. You have tried a variety of methods to improve their outcomes, but nothing works. Do you fire them? #2 - A 50-50 partner in your business is hurting more than helping your business. How do you end the partnership without destroying what you have built? #3 - You desperately need to hire someone to fill an open position. You have limited candidates, maybe only one. You know the best candidate is not ideal, but… do you hire her/him and hope she/he exceeds your expectations? After reviewing these 6 areas, one participant mentioned they struggled to deal with stressful and difficult situations. Like when an employee needs to confronted about poor behavior, or there is a major crisis with a customer. This participant asked for a system to make tough decisions. I obliged. (1) Our beliefs manifest themselves through our upbringing and experiences. (2) Our beliefs define what we consider to be truth, right, and wrong. (3) Our definition of truth establishes our standards of integrity. Our standards of integrity and our commitment to integrity determines our thoughts, behaviors, and ultimately how we make decisions. Furthermore, most people don’t take the time to consider where their values come from, or even what they truly are. Great leaders have clear, specific, personal, and organizational values that provide boundaries for making wise decisions. When facing a difficult decision, always start with your values, personal or otherwise. Most of the time the initial quantity and quality of information given and considered by us is incomplete, negatively affecting our ability to make the best decisions. There are important details, possible outcomes, and more that might be missing. However, despite this obvious gap in the data, we feel pressure to decide quickly or postpone indefinitely. Each of these approaches are habits of a weak leader. Instead, when faced with a problem, you need to immediately begin to research, engage with people, ask questions, and practice active listening to discern the depths of a situation and how each possible decision affects others. Do not fly solo. Engage your team to not just understand, but comprehend the data and your options. It is too easy to let a problem linger, and never resolve the issue. When faced with a tough decision, commit to a deadline early in the process. Obviously you don't want to rush a decision, and you cannot allow others to rush you. But you also don't want to go to the other extreme, which is waiting so long that you are procrastinating. Excessive delay hurts people, relationships, and/or assets. 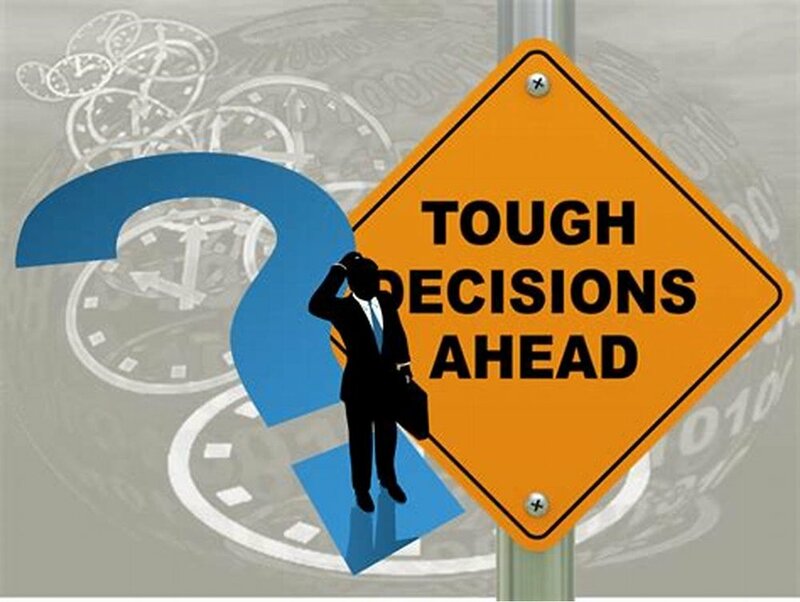 Sometimes it is unclear when the decision must be made. In those cases, take some time to decide when the decision must be made. Great leaders are timely with decisions. Talk with people about the situation who are strong enough to say you’re wrong. You need a combination of courage and respectful candor, and then the wisdom not to quickly dismiss anything that contradicts your bias or temptation. When we ask people for advice, we must seriously consider what they have to say. Their perspective may be exactly what we need, the spark for an idea that leads to improved clarification of the issue, possible solutions, and how those results may affect others. Great leaders fully engage with wise counsel. Systematic Power is the first strand of 3strands Leadership. One of the key applications of Systematic Power is having a consistent, fair, yet flexible process to make decisions. The process can be consistent, yet shorter for less complicated and/or time sensitive decisions. Being systematic builds strong habits related to best practices. It builds trust with others. It helps you better manage your time. Great leaders are systematic in decision-making. Can you test your preferred decision in CRT mode? CRT is at low Cost, with limited people Resources, and in a short period of Time. Maybe you test your decision by posing it as an option to the person who brought you the problem. Or, you may talk with people who have to implement or support your decision, and/or those who are affected by it. I always recommend decisions are introduced as a pilot or test. Why? Positioning the decision as a pilot or test sets a more realistic expectation with others. For instance, a new rule established as a test sets the expectation that it will change, improve, or fail within the test period. They are comfortable with changes or having the rule replaced by a better one because it is their expectation. Great leaders test decisions and leave room for improvement. Too often leaders make decisions without properly delegating who is responsible for fully defining, implementing, and supporting them; providing the resources to make it happen; or the timeframes for completion and review of outcomes. Instead, the leader flies in to the war zone, drops a package, and flies away without any follow-up or follow-through. The leader blames others. However, in reality, the “helicopter drop leader” dropped a bomb by not engaging people, and did not follow-up afterwards to help people develop the new habits, systems, and tools to implement and support the decision. Making a wise decision is important. Systematically giving authority, providing resources, and following-up to build skills, acknowledge progress, and discuss improvements is even more important. Great leaders stay engaged without micromanaging.